SOMERSET, NJ – Takara Belmont announced the release of the Americana Series, a seating lineup that features three unique chair designs each complete with styling, reception, all-purpose, dryer, and backwash variations. The Americana Series styling chairs were created from a concept of urban sophistication and comfort that is natural, wide and open. All of the chairs in the series – the Virtus, Bellus, and Novo – provide ample seating room for clients to relax and enjoy a service experience. With a distinguished square style, chic color combinations, and a stately presence, the Virtus styling chair is an ideal match for male grooming salons and unisex salons alike. It features an ultra-comfortable seat structure, ergonomically refined design, and a 21.5” arm-to-arm seat width for maximum service comfort. The solidly built styling chair is available in two-tone or monotone color variations to accommodate a wider range of design concepts. 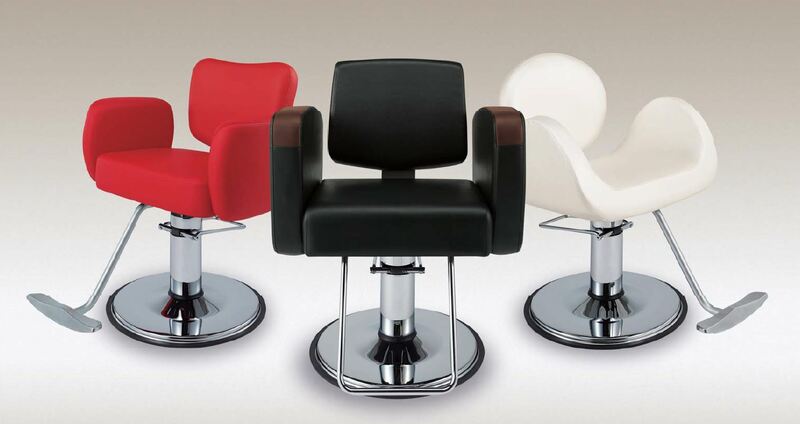 The Bellus styling chair brings an air of refinement to salons or spas through a seating solution that truly shines. Gentle contours, a plush seat, and a sweetheart design add an opulent look and feel to each chair. It features a 21.5” arm-to-arm seat width, ultra-plush cushions, and monotone color selections. Clients will appreciate the stunning style and exceptional comfort of the Bellus chair as they enjoy a relaxing, bliss-filled service experience. Novo chairs carry a modern appeal with a sophisticated and exquisite sense of style. Vivacious curves and an expansive 22.0” seating width cradle clients in comfort, while luxurious foam padding and a lavish balance of graduated support enhances a service experience. The open-concept deign adds a light and airy look, and it also makes cleanups between services a breeze. Available in Grade I & II vinyl or in standard black upholstery, the Americana Series styling chairs include a standard B1A round style base, 217 U-shaped footrest, and plastic chair cover. Optional footrest upgrades are available such as the 317 or G90 footrest selections. Customers may also choose from a complete list of compatible hydraulic or electric base upgrades for an enhanced styling experience. Americana backwash units will be available by the end of Spring 2016. The Americana Series can be seen at Premiere Orlando on June 4-6, 2016. Please visit www.takarabelmont.com or contact your local Takara Belmont representative for additional information about the Virtus, Bellus or Novo styling chairs.